Colorado's answer to Lake Powell, many visitors describe their first view of Navajo Lake as "unbelievable". 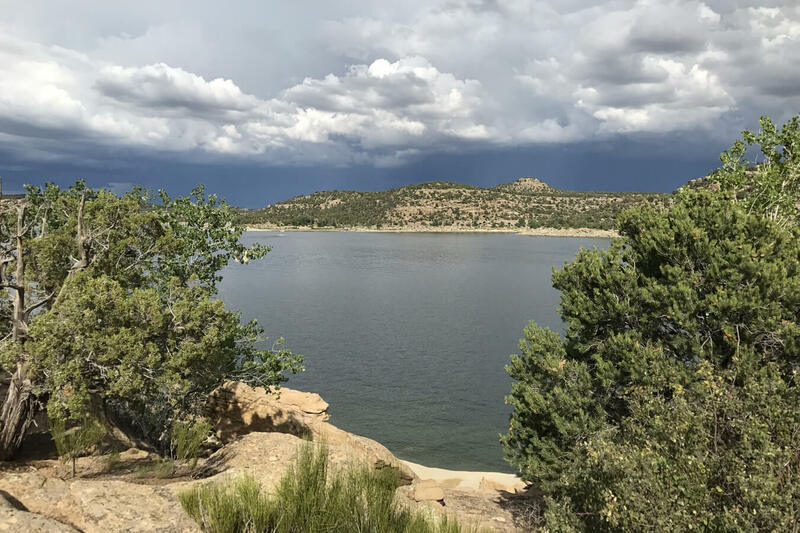 This huge (15,000 surface-acre and 150 miles of shoreline) reservoir extends for 21 miles south into New Mexico. Fish for record-size German brown trout or catfish in open waters without crowds. Camp on your boat or enjoy beautiful lakeside camping with lots of trees. Explore three major rivers and sail or water-ski on open waters. Take advantage of the opportunity to see wildlife such as foxes, deer, grouse and turkeys in the midst of one of Colorado's most historic and scenic areas. Navajo offers 118 campsites and 3 beautiful full-service cabins. There are 39 full service campsites in Rosa Campground, 41 electric sites in Carracas Campground, 24 RV sites with no hook-ups in Tiffany Campground and 14 incredible tent sites that overlook the lake. Eight of these are in Rosa Campground and 6 in Tiffany. All three campgrounds have new camper services buildings with flush facilities and pay showers. All campgrounds are open year round but only the camper services building in Rosa remains open off season. The Rosa Camper Services Building has a self service laundry that is open in the summer months. Winter is a wonderful time to visit Navajo. You will share the campground with families of deer that become less shy in the peacefulness of winter, and bald eagles who soar overhead and sun themselves in trees overlooking the lake.Sites 84 and 103 are reservable through the call center only.